You will be aware that the EDL will attempt, once again, to march in Tower Hamlets on Saturday 7th September and are opposed by UAF, and United East End. The meeting on the 2nd will be discussing how we can show solidarity with United East End, including activities that promote attendance, a local meeting point etc. The meeting will be also be looking at how we build UAF locally. 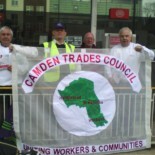 This entry was posted on August 28, 2013 by CAMDEN TRADES COUNCIL.